Every year at this time we revel in the beauty of the trees, knowing well that it is only a fleeting pleasure. Before long the leaves will flutter away from their summer home and become a part of the rich carpet that covers the forest floor. Many people believe Jack Frost is responsible for the color change that takes place in our trees each fall. But we now know that changes in leaf color are the result of chemical changes in the leaf that take place due to certain weather conditions. Leaves get their green color from a pigment called chlorophyll. This pigment, which is necessary for food production, is found in numerous cells throughout the leaf. Along with the green pigment leaves also contain yellow or orange carotenoids. Most of the year these yellowish colors are masked by the greater amount of green coloring. But in the fall, partly because of changes in the period of daylight and changes in temperature the chlorophyll breaks down, the green color disappears, and the yellowish colors become visible. The red pigment, anthocyanin, appears later in the growing season as a result of a combination of factors. Anthocyanin is produced from a high concentration of simple sugars in the leaf cells and warm sunny days followed by cool nights with temperatures between freezing and 45°F. Variations in leaf colors are due to the mixing of varying amounts of the chlorophyll and other pigments in the leaf during the fall season. The most vivid colors appear after a warm dry summer and early autumn rains that prevent early leaf fall. Long periods of wet weather in late fall produces a rather drab coloration. Some of the most startling color combinations are to be found in the leaves of red and sugar maples, sassafras, sumac, blackgum, sweetgum, scarlet oak, sourwood, and dogwood. As the fall colors appear, other changes are taking place. At the base of the leafstalk where it is attached to the twig, a special layer of cells develops and gradually severs the tissues that support, the leaf. At the same time Nature heals the break, so that after the leaf is finally blown off by the wind or has fallen from its own weight, the place where it grew on the twig is marked by a leaf scar. Through fallen leaves, Nature has provided for a fertile forest floor. Fallen leaves contain relatively large amounts of valuable elements, particularly calcium and potassium, which were originally a part of the soil. Decomposition of the leaves enriches the top layers of the soil by returning part of the elements borrowed by the tree and at the same time provides for more water-absorbing humus. North Carolina leads the parade for leaf lookers, and depending upon the season, the species of trees involved, and the relative proportion of the three pigments, just about every imaginable color combination may be seen. 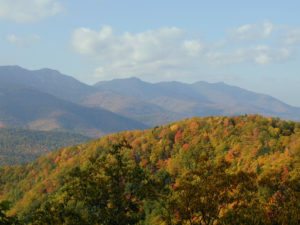 In North Carolina, fall colors begin in the upper elevations of our mountains at the end of September, beginning of October, and run through early November as they spread across the state to the coast. To see how the colors are progressing in North Carolina visit this online map. To see fall colors consider visiting a state park or other outdoor attraction. To locate a state park near you visit the NC Parks site.